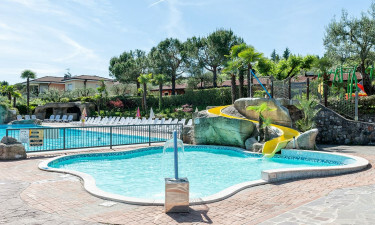 The luxury camping site of Eden is set in the heart of one of northern Italy’s most beautiful landscapes. 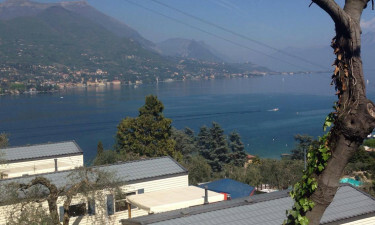 San Felice del Benaco is on the western shore of the spectacular Lake Garda, and with a backdrop of majestic mountains, Eden assures visitors of breath-taking views. This holiday camping site provides luxury camping at its best. Book your luxuriously comfortable and spacious mobile home via LUX-camp to enjoy all of the amenities this luxury camping site has to offer. Camping luxury in a spectacular setting of mountains and lakes. A wellness centre that understands pampering. Plenty of activities for the whole family both inside and outside of the campsite. Nearby villages filled with historical sites dating back many centuries. A mobile home booked via LUX-camp offers the comfort necessary after a long day of sporting activities like tennis, football or beach volleyball, which are all available at this luxury camping site. Besides all of the fun on offer, Eden also takes care of holiday appetites. 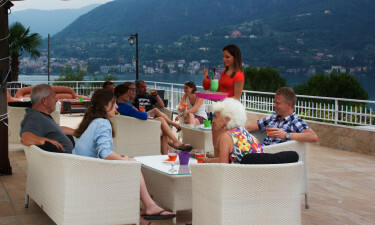 The campsite is constructed in various heights with several terraces and is therefore not suitable for walking-impaired people. Eden is a haven for those wishing to leave the daily grind far behind in order to rejuvenate their jaded spirit. The natural beauty of the landscape brings with it a sense of peace and tranquillity that will quickly soothe the soul and motivate individuals to let go and enjoy the fun to be had at this luxury camping site. With a stunning private beach, swimming pools and water slides, fun-filled, water-based activities are plentiful. Campers may also simply choose to laze on the beach sands or around the pool to soak up the sun and the luxurious atmosphere. Exploring types will find no shortage of fascinating sites to visit and villages at which to shop, sample traditional cuisine, and get acquainted with the friendly locals. San Felice del Benaco has been inhabited since the Roman era, which means a wealth of gothic-roman relics such as the church of Santuario della Madonna del Carmine, or Monte di Pieta which dates back to the 16th century. There are also the regions beautiful beaches like Baia del Vento where visitors can participate in sailing and canoeing amongst a host of other activities. Lake Garda provides those on a camping holiday with every opportunity to participate in every sport both on and under its shimmering waters. Luxury camping in Eden includes a restaurant and pizzeria that do local flavours full justice. For those who want to enjoy all of the foods of the region the surrounding villages will not disappoint with their numerous fine restaurants. An on-site mini market provides all of the necessities that campers require, as well as freshly baked goods. Again, the nearby village markets will offer delicious fresh produce, as well as the renowned olives and olive oil from the region. An abundance of souvenirs can also be found here for the folks back home.